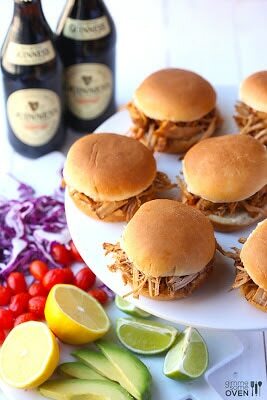 Slow Cooker Guinness Pulled Pork Sliders start with pork that cooks all day in the slow cooker until it’s tender enough to pull apart! Click here to see The BEST Slow Cooker Pork Tacos! Click here to see The BEST Instant Pot Dinners with Pork! I’m not sure why, but sliders just scream summer to me, and these Guinness Pulled Pork Sliders from Gimme Some Oven are a great idea for the Summer Dinners we’ve been collecting. Boneless pork cooks in the slow cooker with Guinness, onion, garlic, and seasonings, and when it’s fall-apart tender the meat is shredded and made into these delicious little sandwiches. Get the Complete Recipe for Guinness Pulled Pork Sliders from Gimme Some Oven.